One of the basic difficulties any study of Shenoute must face is the lack of context. Even for the fifth century, a particularly ill-documented period, his is an unusual case. He is not mentioned in any contemporary sources, from Egypt or anywhere else. Although he has a relatively important place in later Coptic tradition, Greek hagiographers and historians of the church pass him over in silence. With few exceptions, his works cannot be dated and do not name people known otherwise. The only datable "event" in his life would be his much-vaunted participation at the council(s) in Ephesus, yet council acts do not mention him either. To make things even more interesting, his writings come almost exclusively from medieval manuscripts found at his own monastery. An "incomparable" character, indeed, living in an apparently self-contained world. Everything we know about Shenoute comes, inevitably, from his own writings and a biography that is heavily dependent on them, when not biased by an all-too-obvious hagiographic intention. It is not an accident, therefore, that his own self-presentation has shaped our modern perception of him. What we know about Shenoute is what he has decided to let us know about himself. And self-presentation was, for this very egocentric holy man, no light matter. These words and commands were in my heart, and I was concerned to establish them before I depart. I had written them on tablets (pinakis), so when I came to the monasteries [from my desert cave], we copied them onto papyrus sheets during those distressful days before Lent. Thus the great disturbances and all the tearful distress that this miserable man has suffered at the hands of pagans, the violent, and he who goads them against us, Satan, have not been able to keep us from doing everything we want. Don't you know all the evil that they (the evil tax collectors) have tried to do to your brother (i.e., to me, Shenoute) because he says [to them]: "You are evil because you oppress the poor"? Above all, they have tried to do evil to the poor because of your brother, but God has hindered them in their impious plan. One gets the feeling that, for moments, his public self was too massive a burden for his ego to bear. It certainly was too massive a burden for many of his contemporaries. That is, at least, the impression conveyed throughout his works. One of the most interesting aspects of his strategy of self-presentation is his insistence on the widespread negative reactions provoked, in local society, by his actions on behalf of the poor and against paganism. Shenoute's enemies seem to be everywhere, and he claims, with ill-concealed pride, to be the victim of their constant accusations. What other abbot or bishop has ever talked so much about his own alleged crimes? Who preserves so many hostile documents only to refute them? Harboring thieves, "gathering men to fight each other on account of the villages" and distributing bread to them, destroying temples, causing trouble and tumults, being violent, maltreating the poor, making demands of other landowners' tenants, beating up his own monks, helping murderers because they owe money to his monastery, slaughtering cows and pigs in the houses of pagans during Easter, "turning the heart of the poor away" from their pagan masters, breaking into his enemies' houses to destroy their pagan idols, stealing books from "the godless man," using an antipagan raid as a pretext to plunder a village-these are only some of the "crimes" Shenoute was, according to himself, accused of. Being hated by the "right" people and for the "right" reasons seems to have been one of Shenoute's major claims to prominence. He is the sort of controversial figure who thrives on threats, whether real or perceived. This is particularly true of his relationship to Panopolis, the local town across the river, where he likes to claim for himself the status of persona non grata. Panopolis was one of the success stories of late antique Egypt. The city is well known to have been an important center of Hellenism in this period. Numerous poets and grammarians-many of them pagan-were educated there and went on to have successful careers in the imperial bureaucracy. During Shenoute's lifetime, for example, Cyrus of Panopolis, a poet and bureaucrat, managed to become both praetorian prefect and urban prefect in Constantinople. His power and popularity were such that the emperor himself felt threatened. Nonnus of Panopolis, on the other hand, also a contemporary of Shenoute, reformed Greek poetry and became one of the most influential poets of his age. His Dionysiaca is considered the last great epic poem from antiquity. Shenoute's mockery of Aristophanes-who had displaced Menander as one of the "four pillars" of literary education in late antiquity-and of philosophers who "grow their hair like women" also point to the importance of Hellenistic schools in the city. Like Madaura in Africa, also a provincial center of education associated with paganism, Panopolis had a bad reputation among Christian ascetics. When Pachomius established a monastery outside the city in the mid-fourth century, a delegation of philosophers, "who prided themselves on being teachers," came out to challenge the Christian monks in a vain attempt to humiliate them. And the later "Apocalypse of Čarour," a text that attacks the moral decadence of the Pachomian monastic communities, complains that "the roads of Phbow (the main monastery of the Pachomian federation) have become like the roads of Panopolis; we yell like in the agora of Panopolis." As for those of you (people of Panopolis) who will hide behind what you accuse me of having done, you are hateful and hostile to me. And if you (pl.) know God and belong to Jesus (i.e., if you are Christians), truly you are worthy of the curse and you will not escape denying yourselves before the angels of God. For you have lied before Him when you set unlawful words against me in documents. For it is unlawful for you to have written them [but] it is even more unlawful against the crown of your head. For you have left me alive, whereas I deserve to die according to the works that you ascribe to me. And perhaps this is the reason that such a great curse has come upon that unlawful governor from God, who delivered him into the hands of the emperors that they might take revenge on him, even before he goes into the hands of Him who will judge him and you. Him because he did not take my head, you (pl.) because you have not completed your task, oh friends. For if I had not shaken you (sg. ), oh Panopolis, against your works of violence and your servitude of Kronos, you would have accused me to the rulers for nothing. How can a foreign man (i.e., a foreign governor) know whether I am good or I am bad? How will this impure judge-who brought these afflictions onto himself because of bribes-how will he dare say these words, namely, sometimes "What I am going to do with the places of Christ (i.e., Shenoute's monasteries)?" Sometimes also "Shall I kill him?" Just as also that miserable military governor sent to me saying: "Get wisdom." This confrontational style differs markedly from the self-confident poise of Isidore of Pelusium, Shenoute's contemporary in the northeastern corner of the Nile delta. Isidore was also a monk of the "desert" heavily involved in the affairs of the "world." Like Shenoute in Panopolis, he had plenty of enemies in the important harbor town of Pelusium. His blunt denunciations of corruption and injustice recall those so vehemently voiced by Shenoute. Yet Pelusium was his city in a way that Panopolis could never be Shenoute's. He considered it his particular right and duty to plead in front of governors on behalf of his hometown. On the arrival of a new friendly governor, his address to his fellow citizens opened with an exulting "God still cares for Pelusium!" His numerous letters to members of the civic elite emphasize the paideia shared by him and his interlocutors. Shenoute, in contrast, owes nothing-or so he claims-to Panopolis. His rivals and accusers seem to have a tight hold over urban life there. They compete with him and his city on the "hill"-that is, his monastery-for access to usually well-minded but ignorant foreign governors, whose ears they poison with lies about him. Shenoute does not represent Panopolis before Roman magistrates. He represents the "poor," and the oppressors of the "poor" happened to be landowners who lived and ruled in Panopolis. What will I fear from senseless men? Will the lawlessness of the pagans surround me? What will Christ's enemies say against me except for lying about me and [saying] all sorts of things that are not true? Those wealthy and violent people? They have nothing to say against me except for saying: "You turn the heart of the poor away from us, so that they no longer labor beyond their power in the vineyards and everywhere else." And they also say: "He came into our houses openly. He removed what we worship (i.e., our pagan idols) to our shame for we could not hinder him." Therefore I am not worried about these things (i.e., these accusations): Didn't [even] a pagan military governor dare to say when he came here: "I am amazed that you are happy"? I told him: "Why wouldn't they be happy, those who have no God but Jesus?" When his enemies are not lying, they are invariably accusing him of something he is actually proud of. In any case, all those accusations only show his powerful impact on local society. At the same time as he professes innocence, therefore, he preserves every hostile document and makes a point of mentioning those accusations in other contexts. For he may be innocent, but he is certainly not harmless. He likes to provoke and challenge his rivals and adopts a defiant tone when addressing them. For moments, he seems to be flirting with illegality. "There is no crime for those who have Christ," is one of his answers to accusations of theft. "I do not care [about your accusations]. I do not flee from the laws." "Only Christ's tribunal has anything to do with me and I have nothing to confess to its president, Jesus." He claims to be proud of many actions that his foes repudiate, and he never misses an opportunity to proclaim them: raiding the pagan houses of a village and vaunting the spoils removed from them, humiliating his great enemy in Panopolis (i.e., Gesios) by "openly" breaking into his house and destroying his pagan idols with the help of "only seven monks," burning down a temple at Atripe near his monastery, leading all sorts of audacious actions on behalf of the "poor" against the evil landowners of Panopolis... One is reminded of the Syrian monks despised by Libanius: fanatics who "flaunt their excesses, boast of them, advertise them to those who are unaware of them, and claim that they should be rewarded." As he himself sees it, Shenoute's life has, altogether, an almost epic quality. For he is not simply an abbot, a spiritual guide, or even a holy man. He is an Old Testament prophet with a sacred mission. Overwhelmed by the consciousness of being chosen, enraptured by the possession of truth-a truth that he cannot contain-he has no option but to call the sinners of the world to repentance. This is an emotionally taxing duty ("I often weep until I can no longer") that he has not chosen. It has chosen him. As the important studies of Rebecca Krawiec, Caroline Schroeder, and David Brakke have shown, Shenoute takes on such a prophetic role not only in relation to the city of Panopolis but, to begin with, in relation to his own monastic community. From his desert cave, a voice cries out in the wilderness and denounces the lawlessness of the world. This lawlessness is often expressed-as in the Old Testament-in sexual terms: the prophet is a male; Panopolis (or the monastic community) is the woman guilty of infidelity and fornication. Indeed, Shenoute's language is so well blended with that of the prophets that they can hardly be distinguished. In his writings, Panopolis takes on the contours of Samaria or Jerusalem; his enemy Gesios those of a sinful Old Testament king. Like a good old prophet, he claims to be an outsider, both to his community and to the world at large; he acts as the (reluctant) intermediary between God and a world for whose sins he can but weep; he is a lawgiver-for his own communities-and an interpreter of the (biblical) law; he stands for social justice and the poor; and last but not least, he endures perpetual persecution. It has recently been argued that Shenoute's biographies are but late compilations that were put together centuries after his death. This may well be right, but the fact remains that these biographies depict Shenoute precisely how he would have wished to be remembered. He is, here again, an Old Testament prophet whose "righteous anger" cannot be checked, who communicates through histrionic gestures, and whose feats defy belief. We see him confronting the patriarch of Constantinople, Nestorius, in the midst of the bishops at the Council of Ephesus; physically defeating an "impious pagan" in Panopolis-on behalf of the poor, of course; miraculously facing down a pagan military governor at Antinoe, the provincial capital, in defense of his fellow Christians . . .
Shenoute of Atripe: stern abbot, loquacious preacher, patron of the poor and scourge of pagans in fifth-century Egypt. This book studies his numerous Coptic writings and finds them to be the most important literary source for the study of society, economy and religion in late antique Egypt. The issues and concerns Shenoute grappled with on a daily basis, Ariel Lopez argues, were not local problems, unique to one small corner of the ancient world. Rather, they are crucial to interpreting late antiquity as a historical period—rural patronage, religious intolerance, the Christian care of the poor and the local impact of the late Roman state. His little known writings provide us not only with a rare opportunity to see the life of a holy man as he himself saw it, but also with a privileged window into his world. Lopez brings Shenoute to prominence as witness of and participant in the major transformations of his time. Ariel G. Lopez is Professor at Rhodes College. 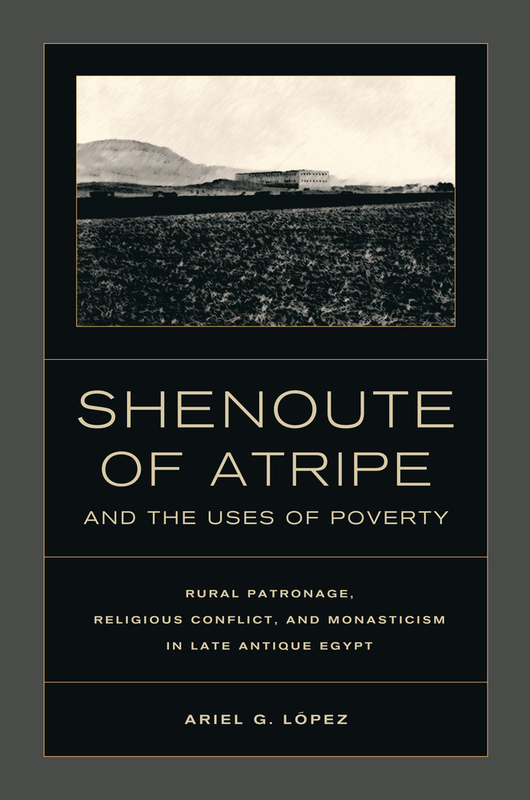 Lopez provides a new and exciting profile of Shenoute of Atripe that analyzes the abbot's career and contextualizes it within the social history of the late antique East. Perhaps the book's most important contribution is its proper (and overdue) restoration of Shenoute, one of the best-documented rural patrons of late antiquity, to the broader conversation about poverty, patronage, and shifting centers of power that has reshaped our understanding of the later Roman Empire. This book has much to offer both scholars interested in Shenoute and those working on the wider empire to which he belonged.